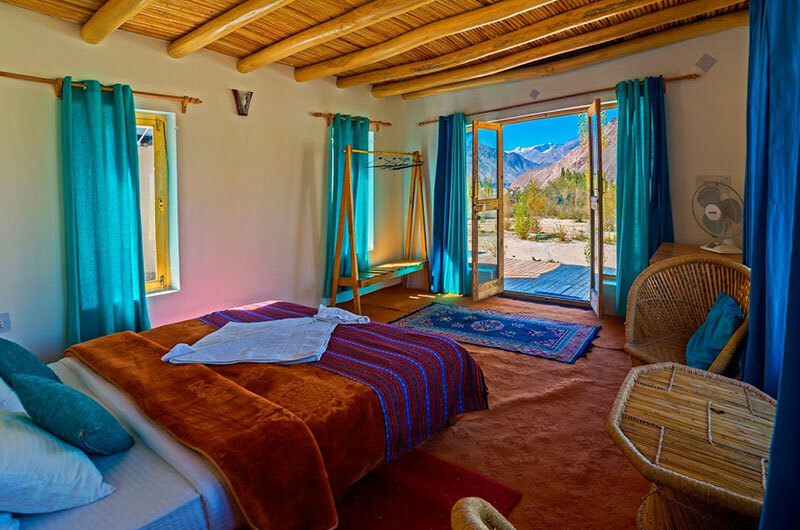 Nubra ecolodge is a family run ecotourism venture, located near Sumur sand dunes in the Nubra Valley. The landscape facing the confluence of Shyok and Nubra rivers is the natural habitat for seabuckthorn, wild flowers and desert wildlife. The 11 acre farm with our family home, has been planted with poplar, willow, apricot and apple trees, along with vegetable gardens. 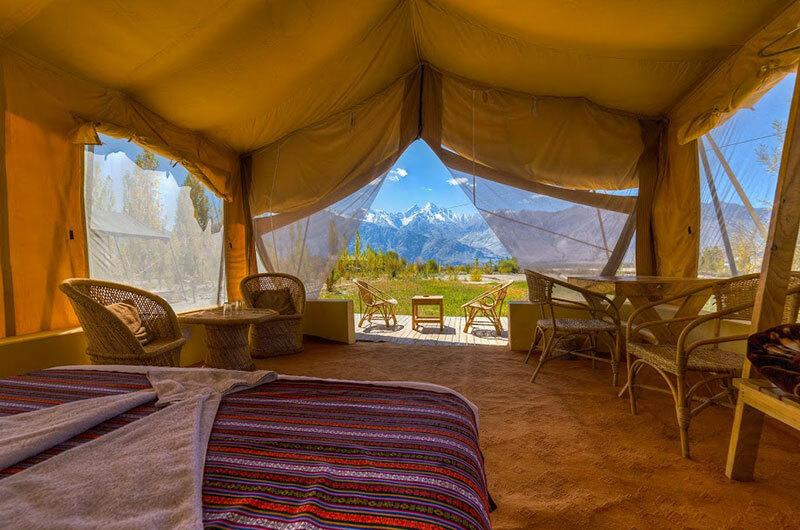 It commands a 360 degree view of the Karakoram mountains, the sand dunes and the nubra river. A large open deck facing the valley near the vegetable garden is used as a lounge or for dining in fair weather. 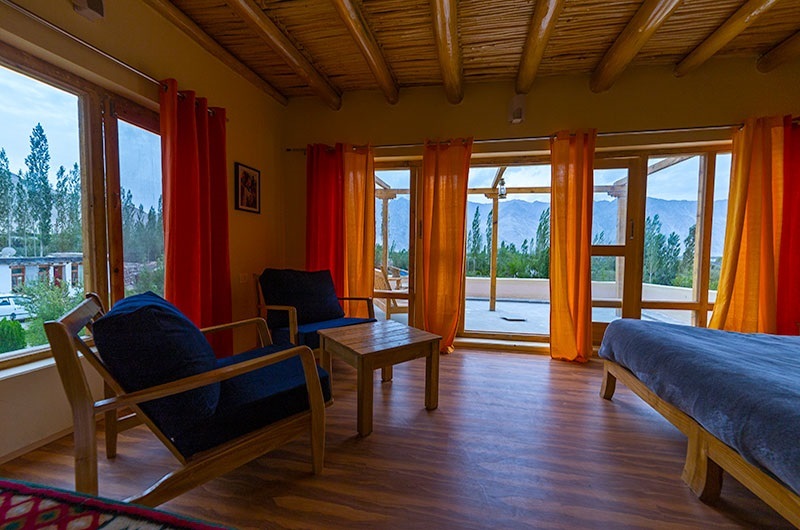 Ideal location to go for long walks along the Sumur sand dunes and the nubra river. We recommend a minimum two days stay to enjoy the nubra experience. The Shyok River meets the Nubra River to form a large valley that separates the Ladakh and Karakoram Ranges. 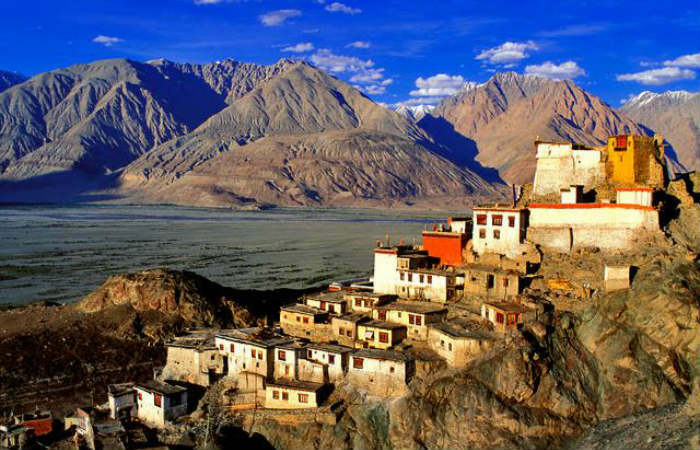 This 10,000 ft (3048M) high altitude cold desert with rare precipitation and scant vegetation except along river beds and villages, which are irrigated and fertile, producing wheat, barley, peas, mustard and apples, walnuts, apricots and almond trees. 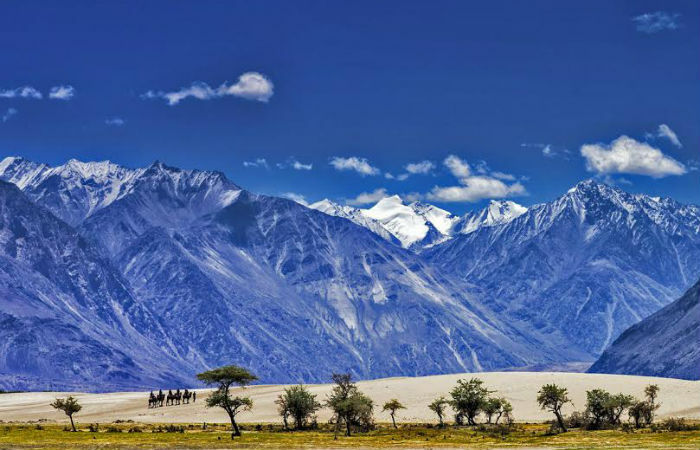 The valley extends up to Turtuk to the north west and Siachen Glacier to the north east with the Sasser and Karakoram Pass connecting Nubra with Xinjiang, forming the old silk route. Five Cottages with decks and Four Safari Tents with decks and en suite bathrooms all facing the snow capped mountains and nubra river valley. The Main house has a GuestRoom with ensuite bathroom on the ground floor and four GuestRooms on the first floor with a large terrace. All the rooms can accommodate one extra bed. The meals are served in the traditional dining or on the open deck in good weather. The Main house has two GuestRooms with ensuite bathrooms on the ground floor and one GuestRoom on the first floor with a large terrace. The rooms have king sized beds or option for twin beds and also can accommodate one extra bed at a cost. With the other common spaces in the house this is ideal for large groups also.